This was a very interesting novel that touches on mental illness; specifically OCD and anxiety. This is portrayed throughout the entire novel. I can totally understand why this book may trigger some people's issues with their own mental illness as it is very strongly described. I however thought that the representation of it was done really well as I myself suffer with a little OCD with some things, as well as anxiety and depression. 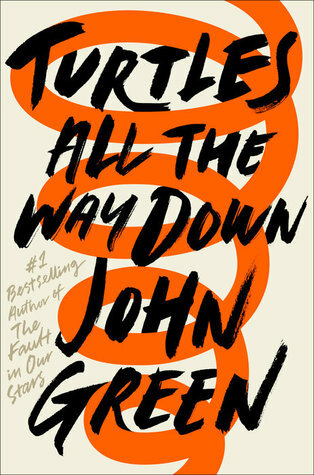 I think John Green had put a lot of his heart and soul into this as he has suffered too, and I feel like that's why it was done so well. The friendships in this book were so strong too, and you can honestly see them through the pages with the dialogue and actions. There was a couple of times when Daisy did annoy me as a character, but other times when I liked her. As I was reading about Aza, I could feel that she was very reserved in herself and wanted to keep to herself a lot. What I liked was that it showed that mental illness can't be fixed with the flick of a switch; that it takes time and a lot of hard work in yourself. I also really enjoyed the mystery aspect to this novel with Aza searching for Davis's father. It was almost as if she was using it as a distraction from her own problems. It was weird because at time I found myself to be dragged away from the story, but other times I felt like I wanted to pick the book up to find out what happens next. I was satisfied with how this book ended, and it is definitely one of those books that will stay with you after you read it. Unfortunately because John Green wrote "The Fault in Our Stars" (which is one of my all-time favourite books), he still has yet to write a book that will conquer this. I however will still continue to pursue into his other future works. Sign into Goodreads to see if any of your friends have read Turtles All the Way Down. 60.53% "Starting to lose a little interest."